Spectacular alpine morning on the top of the pass. Cold, crisp, and clear. My tent is pitched with the door facing the sunrise. Just a hint of bright orange on the eastern horizon as I peek out from under my tent. The cold mountain is not as cold as it was in the valley I camped in last night. I eat breakfast in my tent with the thought that this is the last time I'll be doing this maybe forever. Will I ever be hiking again by myself where sitting in my tent for breakfast makes sense? I follow my standard routine automatically, salvaging the final snacks, the last food in my pack and stuffing my pockets. The extra miles yesterday mean today's mileage is only twenty miles with the border monument in the middle. I emerge from my tent and pack my pack just as Bey and Wildflower sit down together for the social event known as breakfast. I feel bad that I ate in my tent. I'd rather sit out here and eat with others. I can't remember the last time I ate breakfast with others out on the trail. Ah well, it is what it is. I chat with them as I pack and take down my tent for the last time. Bey says she wants to hike alone to the monument which suits me fine. I like hiking alone in the morning. Besides I'm ready to go now. What a wonderful fall day this is. This is what I think of when I think about how much I like to hike. The cool morning air contrasts with the bright sunshine. I walk into and out of the sun alternately warming and cooling off. Just as I start to get too warm the trail turns into the forest or behind a ridge and I'm in the cool shade. Just as I get so cold I feel I need to put on another layer I pop out into the warm sunshine. The forest is silent and welcoming an occasional chipmunk or pika breaks the silence with a chiding chatter or the pika’s distinctive Eeeeeek. I pass over plenty of water sources before finally stopping at one and filling my empty bottle. I have no Aqua Mira or squeeze bag for my microfilter. I can attach the filter to the bottle and drink through it but that is a lot of work and more than I want to do. The water up here is ice cold and clear, probably fine to drink without filtering. Still I hesitate and decide I'll only drink it if I need to. Right now I don't need to, so I carry an extra pound of water. Old fears are so hard to let go of. Even in this place of plentiful water I feel the need to carry three quarters of a liter of unfiltered water ‘just in case.’ I guess it'll take more than a PCT hike to completely get over that fear. I walk filled with all kinds of mixed emotions and thoughts. I find the emotion wells up within and leaks out of my eyes in tears. Not that I'm sad, I'm overcome with feelings of the grandness of this moment. Years in the planning from my first thoughts about Big Hairy Audacious Goals, to thoughts about blogging continuously for the entire trip for my grandkids, to thoughts about raising awareness and money for ALS research to help my friend Shelly. All the dreams, plans, training. How many people to thank! Scout and Frodo way back in San Diego. Countless trail angels along the way. Special places and people. Adventures, pain, dirt, sweat, weather that's too hot, too cold, too wet, dry sections without water. I feel I have lived an epic. How many new trail friends? Other Thru-hikers who have lived through the same experiences. How we all hiked our own hikes with the threads of each weaving themselves around each of our memories and hearts. How important it is to hold relationships with an open hand, some stay and grow and build deeper longer connection. Others pass in and through my hike and memories like so many different colored pieces of thread weaving a beautiful tapestry of memories I will always treasure. A few hours more walking and I reach a spot above where the monument must be. I can see a line cut thru the trees. The clear cut that marks the border between the US and Canada. It comes down the hill across through the clearing below and right in front of a sharp turn in the trail. The top of three switchbacks which I descend to find a number of my fellow thru-hikers cheering and clapping for me. 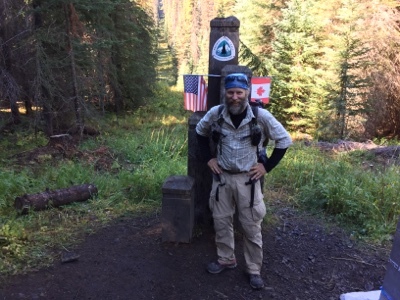 There is Monument Seventy Eight and the northern terminus of the PCT, a sister to the southern terminus I left one hundred and thirty seven days ago. I complete a continuous footpath from Mexico to Canada today, September fourteenth at eleven AM. I remove my pack and join in cheering for the other thru-hikers that are coming down the trail behind me every ten to fifteen minutes. Soon we have a merry little band laughing, high-fiving, fist bumping each other. We take group photos. Thirteen has a camera full that he promises to share with the rest of us. Some have champagne they open and shake spraying themselves and those around. Like we've won the Indy five hundred or something. We did! Not as a speed record. It's more personal, we've all arrived here at the end of this journey having overcome all kinds of obstacles, fears, and physical maladies. We've lived through days of excruciating pain, deprivation, exposure. We been confronted with the idea of who we thought we were versus who we really are. We've pushed ourselves beyond what we thought we could do. We kept walking when almost everything in us wanted to stop, to quit. Each of us is changed. We have new skills and scars. For me I find I have a new love for people. They are the best part of the PCT and the true treasures of life. I want to live my life around people. They may have different thoughts, backgrounds, beliefs, opinions, politics, values, you name it. There is very little I have in common with my fellow thru-hikers in this clearing in the middle of the forest except we’ve all lived through a common experience that was yet uniquely tailored to our own choices and temperaments. I think that in this way the PCT is like life itself. We all have our own journeys. We all have different pasts and backpacks we carry filled with our previous experiences. We find ourselves at the same place and the same moment in time to share some common time together. That common time together begins and builds relationships. Will I ever see any of these people again? I don't know, I know I'd like to. If for no other reason than to relive those moments of hardship, adversity, and pain through the lens of time and laugh at them together. Yes that was tough, but here we are. Poppy and I leave while others are still celebrating. We walk the eight or nine miles to Manning Park talking about the different experiences we’ve had, some that we shared others we had at specific places at different times which created completely different experiences for each of us. We talk about new friendships and others we haven't seen for some time. How some drop off the trail and sort of disappear. This wasn't their year, or maybe this isn't their trail, or whatever. So many people I've met. I think about Ufda who I past yesterday as he was hiking back to Harts Pass. I realize just now that he's the person I've known the longest, having met him at Scout and Frodo's way back on the first day. The miles pass quickly and we find ourselves at the real end of this story, Manning Park. A beautiful spot for a lodge. A valley in a Canadian forest surrounded by a flora in the throes of transition from summer to an early fall. The bright yellows, oranges, and reds of the deciduous trees and plants contrasting with the deep greens of the surrounding evergreen forest. The weather has held up, sunshine and blue sky. Far exceeding my expectations or hopes. We walk down the road to the lodge. The sun is warm. My thoughts, hopes, and dreams turn to home, family, and friends. How I want to make a greater effort to make time for those people I've found have journeys that intersect mine. How I want to hold relationships with an open hand. To live with grace and generosity with those whom I'm fortunate enough to be close. To put relationships first before others distractions like careers, hobbies, and activities which at first glance seem to be the essence of life but are really just the background, the set, the stage. Real life is found in the connections I have with others. That, at least, seems to be the most obvious thing to me after two thousand six hundred and sixty three miles or so of hiking along the Pacific Crest Trail. Day 130 : Cold, Wet, Lonely; How Low Can You Go?